Abstract - We present THz near-field measurements and calculations of the electric field around metal objects with sizes comparable to the wavelength. Several examples are presented, such as the fields of one metal sphere, and of several spheres. We show how the near-field depends on the THz polarization and frequency and on the distance between the spheres. Our results are compared with Mie theory describing the scattering of light by particles. The enhancements of the field due to a sphere are compared with those generated by a metal tip used for near-field imaging. Terahertz apertureless near-field scanning optical microscopy (THz-ANSOM) is a new technique to obtain a sub-wavelength resolution at terahertz (THz) frequencies. In addition it allows us to measure both the amplitude and the phase of the THz field in the vicinity of the object. A THz pulse is generated using a conventional THz spectroscopy set-up . The THz beam is focused onto a 500 μm diameter brass sphere. The beam width is larger than <?xml:namespace prefix = st1 ns = "urn:schemas-microsoft-com:office:smarttags" />1 mm. The polarization of the incident THz light is parallel to the crystal surface. 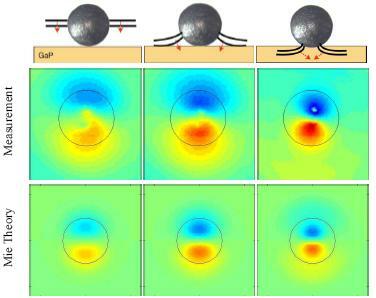 The sphere is positioned on the surface of a (100) oriented GaP crystal which is coated with a thin layer of germanium. From the back, using a reflective microscope objective, a probe laser pulse is focused to a 10μm spot size directly underneath the sphere and reflected back to a standard differential detection setup. It measures any polarization change, induced on the probe by the presence of a THz electric field inside the crystal, but only by those field components which have a polarization perpendicular to the crystal surface. The crystal and sphere are raster scanned through the beam in order to record an image of the field in a plane underneath the sphere. It is important to realize that the perpendicular components Ez of the fields only develop due to the presence of the sphere. The Mie theory provides rigorous solutions for light scattering by an isotropic sphere embedded in a homogeneous medium. The near-field is calculated for a discrete number of frequencies within the bandwidth of the THz pulse. The calculations are then combined to represent the near field of a THz pulse near a metal sphere  and the results are compared with the experimental results. Fig. 1 shows Ez at different time across the pulse. The upper plots are the measurements, the lower the Mie theory calculations. The initial polarization of the THz pulse is perpendicular to the pictures. Figure 1. Perpendicular component of the Terahertz Field in a plane under the sphere at three different times (from left to right). The circles represent the diameter of the sphere. Up: measurements; down: calculation from the Mie theory at 0 μm from the bottom of the sphere. Blue and red represent positive and negative Ez values respectively. The electric field has to be perpendicular to the surface of the sphere, so the wavefront is bends around the sphere. As a result, there is a creation of a perpendicular component of the field under the sphere. One can see that at first, Ez is located at the edge of the sphere. While the pulse propagates and as the field bends around the sphere, this maximum gets closer to the middle of the sphere. Ez is antisymmetric to the plan perpendicular to the polarization as expected. We have shown the near field measurements of a field enhancement around a spherical object. The results are fitting the Mie theory modeling. G. Zhao, R. N. Schouten, N. van der Valk, W. T. Wenckebach, and P.C. M. Planken, Rev. Sci. Instrum. 73, pp. 1715, April 2002. A. S. van de Nes, “Rigorous Electromagnetic Field Calculations for Advanced Optical Systems”, Thesis TU-Delft, 2006.